DUMBARTON stunned Ladbrokes Championship leaders Dundee United by winning 1-0 at the Cheaper Insurance Direct Stadium on Hogmanay. 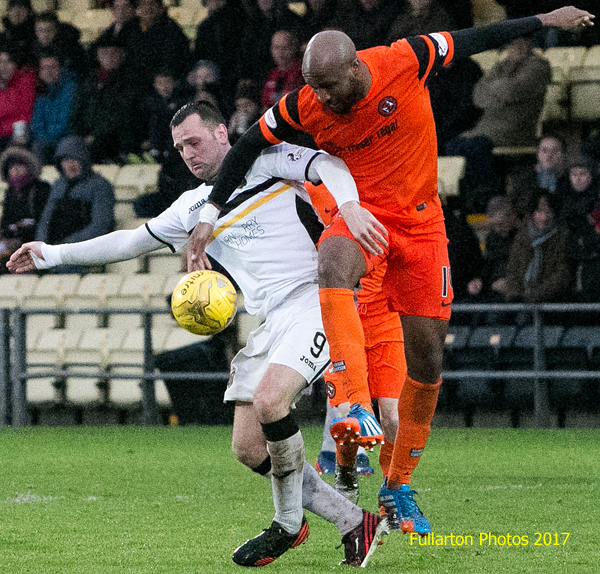 DUMBARTON stunned Ladbrokes Championship leaders Dundee United by winning 1-0 in front of a 1,212 crowd at the Cheaper Insurance Direct Stadium on Hogmanay. The result of a match played in strong wind and torrential rain meant that Ray Mackinnon's men slipped to second in the table, with Hibs regaining the lead. It also meant that Sons finished the year in seventh position. Dumbarton had the wind behind them in the first half, with both sides having a fair amount of possession and Sons looking impressive at times. Ten minutes in Sam Stanton smashed a wonderful shot just past the far post after spotting United's keeper Cammy Bell off his line. Then on 28 minutes Dumbarton broke the deadlock as Mark Docherty whipped in a cross and it flew all the way past challenging Josh Todd and keeper Bell — and into the top corner. The pace increased after the opening goal, with Sons keen to press their advantage and the visitors fighting to get back into the game. United threw everything at Dumbarton as the match drew towards its finale and the swirling wind and rain increased. But Sons held firm, defending with great tenacity, to take all three points from their high-flying opponents. Garry Fleming is pictured getting the better of giant defender William Edjenguele.